To celebrate MJ's birthday, we trekked to see a butterfly-filled greenhouse at a park in the suburbs. 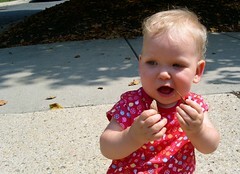 Here's our one-year-old outside the park - she's either playing with a leaf, or preparing to light a pipe. Can't remember which. Ahh, if you look at the larger version of the picture, you can see it's a leaf. 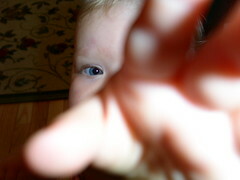 This is why it can be hard to take close-ups.